As energy consumption is predicted to increase by 84 percent by 2035, new sources of energy, including biofuels, will play a crucial role in meeting this demand. With the dramatic growth of this industry there comes a need for reliable flow components essential in all aspects of the biofuels production process. From small start-ups to large corporations, biofuel engineers rely on Assured Automation’s high performance butterfly , angle body, and thermal and remote shutoff valves. For bioethanol production, Assured Automation offers a variety of manual and automated valve options necessary in all phases of production. Valves integral to the fermentation, molecular sieve and distillation processes are available as well as valves for steam and air dryer auxiliary lines. 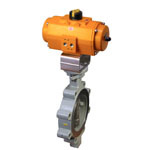 Assured Automation’s high performance butterfly valve (HP Series) is available in carbon or stainless steel, in sizes 2″ through 24″, 150# or 300#, wafer or lugged end connections. The HP Series offers Class VI shut-off and an advanced seat design which provides a bi-directional interference and pressure assisted seal. The HP Series disc is engineered for a quick release from the seat, which reduces torque and seat wear. The HP can handle temperature spikes up to 600°F which are often encountered in the early start up and molecular sieve portions of bioethanol production. 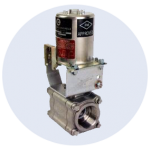 The Angle Seat Valve is designed for liquid, gas and steam applications. The valve body is offered in either brass or stainless steel. Available in 3/8”-2” line sizes, this angle seat valve is offered with NPT, triclamp or flanged end connections in normally closed, normally open and double acting valve configurations. Teflon seats withstand steam pressures up to 150 PSI. To address safety concerns in fuel processing plants, Assured Automation supplies a complete range of Thermal Safety Shutoff Valves. The FM Fire-Safe Thermal and Electro-Thermal ball valve and butterfly valve assemblies are designed to spring a valve to a designated position (open or closed) during an upset condition such as fire. Valves are mounted with a spring canister and thermal link. The thermal link will melt at a predetermined temperature (165°F-500°F) and spring the valve to a chosen fail position. The FireChek is a heat-actuated emergency shutoff for gas and flammable liquid equipment. The FireChek safety mechanism is used in air lines on control valves with pneumatic actuators to provide emergency shutdown in case of fire. Thermally activated Emergency Isolation Valves (EIVs) are critical components in refinery, terminal and distribution safety systems. Thermal activated shutoffs work like fuses in the piping that carry extracted fuels. When a fire occurs, the fuel flow is shut down, preventing the fuel from feeding the fire. This entry was posted in Biofuel Industry, Latest News and tagged Angle Valves, Automatic Gas Shutoffs, biofuel valves, High Performance Butterfly Valves, Thermal Activated Gas Shutoffs. Bookmark the permalink.